Is it, could it be, kind of preppy? Am I, in my old age, rejecting the downtown girl aesthetic and replacing her with an uptown sensibility? Well, for the 2008 Payless summer collection, yes, I am. But I'm not giving up on Abaete, never. I'll still be scouring Payless in August, keeping a keen eye out for her always fabulous boot collection. While I certainly agree that it's very easy to go overboard on 'American Indian' themed accessories, I'm pretty crazy for all of the ones I've seen on UrbanOutfitters.com. All of the jewelry has just the right amount of flair to make it fun and not as if you're trying too hard. 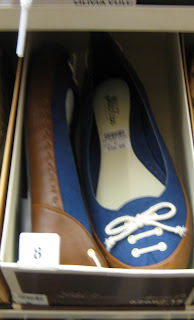 The two-tone shoes with the little bows are adorable. yes, the two tones are so cute! bravo, lela. and the strap does look itchy, although the abaete's are usually a lot more comfortable than they look. hmmm, have to check out the urban outfitters, thanks cupcakes b/c I do have it in my blood!